Water from Edmonton is boosted by electrically-driven pumps at the boundary pumping station along Highway 2 south, roughly 1 km south of the City of Edmonton. The transmission main from the boundary pump station supplies water to the City of Leduc with lateral mains feeding Beaumont, Calmar, Leduc County, New Sarepta, Hay Lakes, Armena, Millet and the EIA. The amount of pressure supplied by the booster pumps depends upon demand, which varies based on reservoir levels at the different municipalities. The current transmission system is pictured to the right. The Supervisory Control and Data Acquisition (SCADA) control system is designed to provide operating information and control capability for the water transmission system. This is performed through a communication system link between the 14 Programmable Logic Controllers (PLC) located at each of the fill station sites, the booster station and the boundary station. The host PLC, located at the boundary pumping station, collects data from each site and transfers new data to the PLCs as required. Endpoint adjustment, such as starting of pumps and modulating of valves, is performed by the onsite PLCs upon receipt of command from the host PLC. The host PLC receives commands from the human machine interface (HMI) located at the boundary pumping facility. The HMI displays and communicates all SCADA related events for commission operators. Total flow received from Edmonton is compiled by the EPCOR’s master meter, which is situated in the boundary station. This meter is owned by EPCOR and is serviced on site. A magnetic flow meter keeps a record of water leaving the boundary station into the commission’s supply line. Each fill station contains a magnetic flow meter which relays flow rates and totals instantaneously to the main controlling facility. 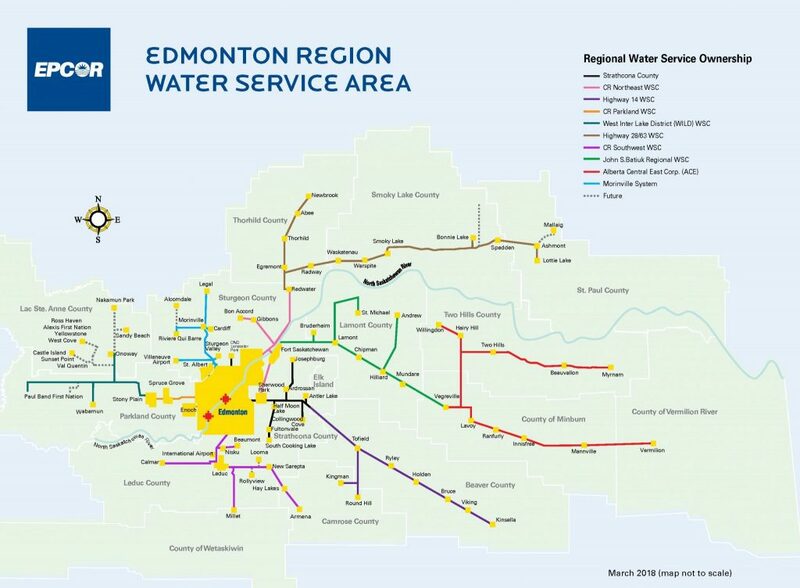 The map to the right shows the EPCOR Capital Region Water Service Area. The City of Leduc is contracted to provide management and operations services for the Commission. 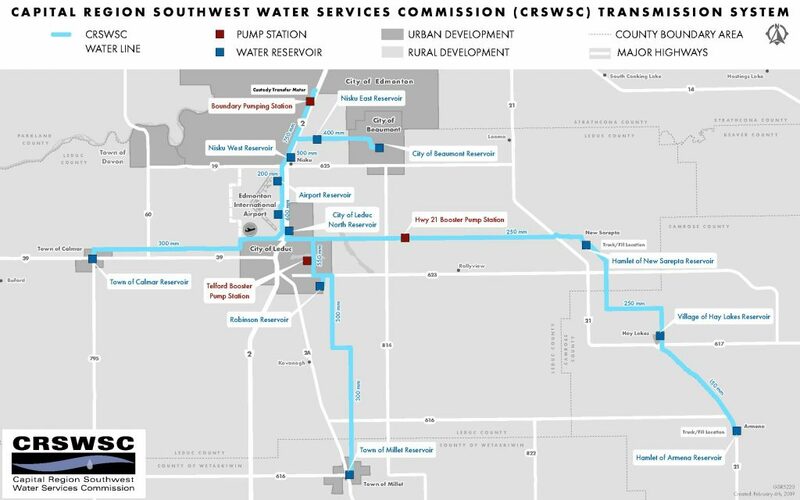 Copyright © 2018 The Capital Region Southwest Water Services Commission. All Rights Reserved.